Suzy supported the case of Yang Ye-won, a YouTube celebrity who recently alleged that she was groped and forcibly photographed by a group of men when she tried to start out as a model in 2015. 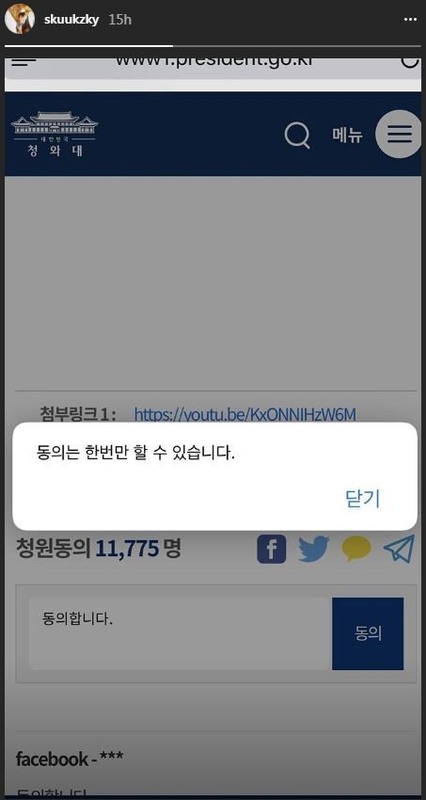 On Thursday, Suzy updated her Instagram Story with the screenshot of her endorsement of the online Cheong Wa Dae petition requesting the Korean government to step up the efforts to investigate Yang’s story. The Korean presidential office of Cheong Wa Dae receives petitions via its website. If a petition gathers more than 200,000 endorsements within 30 days, government officials are obliged to give an official response to the matter. The petition in support of Yang’s sexual harassment case had around 11,000 endorsements prior to Suzy’s Instagram Story. As of 11 a.m. on Friday, after Suzy made her endorsement public, that figure rose to 110,000. Yang on Thursday wrote on her Facebook page that she had applied for a part-time job as a fitting model in 2015. She signed a contract with a company, but at the first shoot she was locked in a room with 20 or so men and forced to dress in revealing underwear and pose for lewd photos. Yang said she feared what might happen if she refused and followed the men’s requests. In the process of the shoot, she claims that she was groped and harassed. She says she later found her photos on adult websites, which caused her serious mental torment. Police on Friday launched an investigation into Yang’s case.